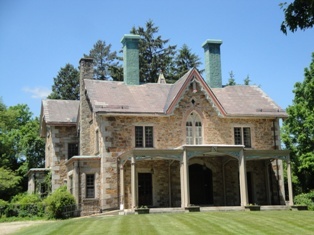 Queset House, named for the stream which winds through the grounds, is a stone house of English Gothic style. The house has beautiful walled gardens, sloping lawns, and a pathway to the restored Italianate Queset Garden. The lovely wood paneled main floor has several large rooms, including a kitchen and two bathrooms and is ideal for small-to-medium sized events. Queset House is a casually elegant, affordable option that gives you the flexibility to design a memorable, personalized occasion. This house is an historic building and part of the Ames Free Library Campus. Because of the unique nature of our property, event times are limited. If you are interested in hosting an event here, please fill out the form below. For fees and other information please see our Rental Guide for Events. Please enter the date you wish to rent the Queset House on. If you are unsure, an estimate is okay. Birthday, baby shower, sweet 16, anniversary? Let us know what type of event you have planned. Please leave the best number at which to reach you, so that our Development Manager can follow up with you regarding your inquiry. If possible, please provide a valid email address so that our Development Manager can share important documents related to Queset House Rentals with you.